Brock's PARTHENON® Support System (patented) is designed specifically for use with Brock's TRI-CORR® Aeration Flooring and offers a superior load-bearing capacity complementing the strength of the TRI-CORR Floor. The PARTHENON Support was selected as an AE50 Outstanding Innovations Award Winner for 2006. The award is sponsored by the American Society of Agricultural and Biological Engineers’ Resource magazine and recognizes the top 50 innovations in agriculture produced during 2005 that help to improve and enhance agricultural, biological, food and related industries. Brock's PARTHENON Supports are available to provide 349- or 470-mm (13 3/4- or 18 1/2-inch) heights for grain drying and aeration. The low PARTHENON Support has enough floor clearance to allow for 254-mm (10-inch) diameter unloading systems. Quick and easy to install, the PARTHENON System requires only half the usual number of support rows, plus it reduces the number of supports needed by two thirds. PARTHENON Supports use a non-staggered installation and easily lock together with an included inter-lock system to eliminate movement. The support's design helps to compensate for uneven concrete flooring. Aerodynamic design of the support's built-in vertical column aids efficient air flow in tunnels and near fans. 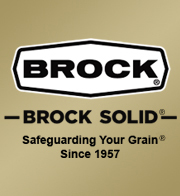 Brock's conventional channel-lock floor supports are available in 330-, 427-, or 470-mm (13-, 16 13/16-, or 18 1/2-inch) heights for grain drying and aeration. Set up is achieved with a snap and lock system that anchors each support securely to Brock's TRI-CORR® Floor plank. These supports retrofit to Brock's previous channel-lock floors. Galvanized steel flashing at the silo sidewall helps to complete the floor installation. Galvanized steel flashing perforated to allow maximum airflow. At the sidewall, the flashing is formed to match the sidewall's corrugation for a positive seal that also helps prevent grain loss. Flashing is corrugated for greater strength.